Stadler won backing from his board despite criticism about his handling of the diesel scandal. NECKARSULM, Germany -- Audi pledged full transparency as it continues to recover from diesel emissions fraud but shareholders at the company's annual meeting on Thursday again urged managers to reveal more about the scandal. Ever since the emissions violations were disclosed in 2015, investors have called on Audi and its parent, Volkswagen Group, to come clean about the fraud and some say they are shocked the findings of an internal inquiry have still not been released. Audi, the biggest contributor to VW Group's profit, admitted in November 2015 that its 3.0 liter V-6 diesel engines were fitted with a device deemed illegal in the United States that allowed vehicles to evade U.S. emissions limits. Volkswagen has agreed to spend up to $25 billion in the United States to address claims from owners, environmental regulators, states and dealers and offered to buy back about 500,000 polluting U.S. vehicles. 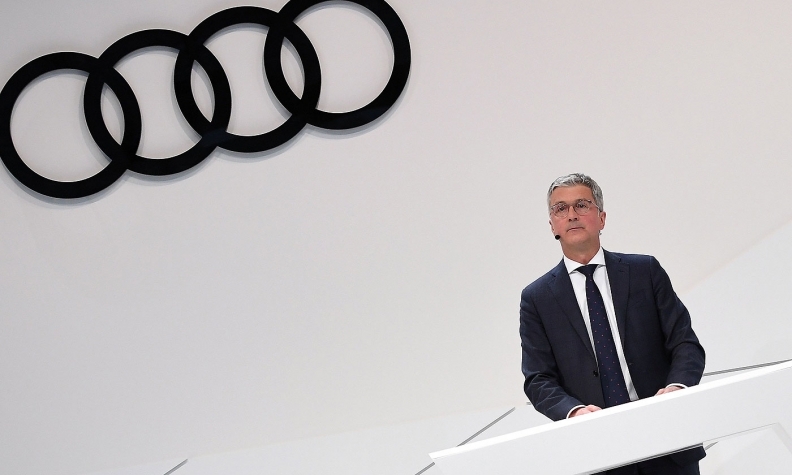 "We will continue until the job is done," CEO Rupert Stadler told shareholders on Thursday, promising to make law and ethics Audi's "ultimate benchmark." But shareholders accused top managers of delaying investigations, criticizing its refusal to publish an inquiry led by U.S. law firm Jones Day and disputing the view that lower-ranking managers, rather than executives, were to blame. "It's high time that promises for a blunt clearing up through full transparency by management bodies will materialize," said Christian Strenger, a supervisory board member at DWS Deutsche Asset Management. "Denying and deferring is all we have been hearing to date." Stadler, 54, who has run Audi since 2007, won unanimous backing on Wednesday from the automaker's 20-member supervisory board for another five-year term on Wednesday, despite criticism of his handling of the scandal. Some shareholders, such as Felix Schneider of shareholder rights group SdK, refused to endorse Audi's management at the shareholder meeting on Thursday. "Audi has failed to clear up the diesel scandal for the public and for shareholders in a transparent way," he said. Stadler won the backing of labor chiefs on the supervisory board on condition he take steps to secure employment at German factories at a time Audi is pushing to build more SUVs abroad, a source close to Audi said. Separately, Stadler said Audi's sales in China were continuing to fall significantly after plunging 18 percent in the first four months of 2017 as a result of a dispute with dealers in the luxury brand's largest market. Dealers for the FAW-VW joint venture in China fear that plans for an Audi joint venture with VW Group's southern JV partner SAIC to build and sell Audi vehicles via SAIC-VW's retail network will hit their sales. Audi's worldwide deliveries rose 4 percent last year to a record 1.87 million cars. Audi, like VW, is raising spending on electric vehicles and self-driving technology with the goal of increasing the share of battery-powered cars to about a third of its sales by 2025.